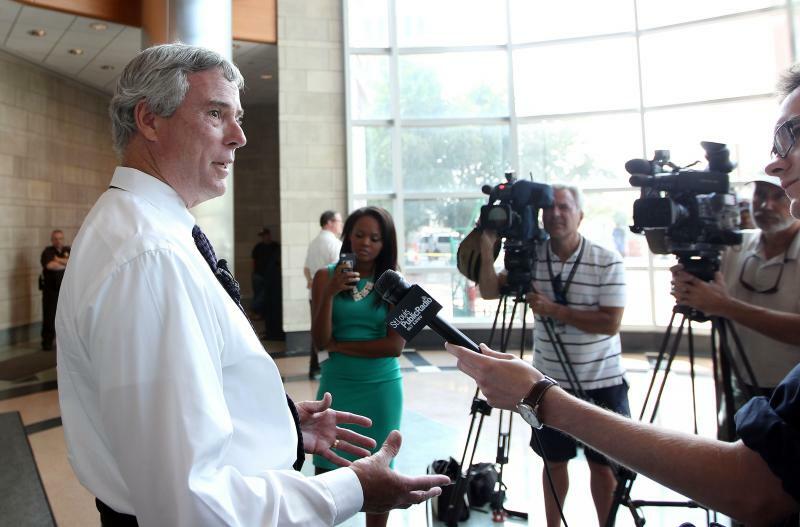 Could McCulloch Delay Grand Jury Announcement To Help Stenger? Councilman Steve Stenger, D-Affton, shakes hands with St. Louis Prosecutor Bob McCulloch during last year's announcement of Stenger's county executive bid. St. Louis County Prosecutor Bob McCulloch was helping Councilman Steve Stenger in his bid for county executive from literally the moment he started running. McCulloch was the introductory speaker at the Affton Democrat’s campaign kickoff last year. 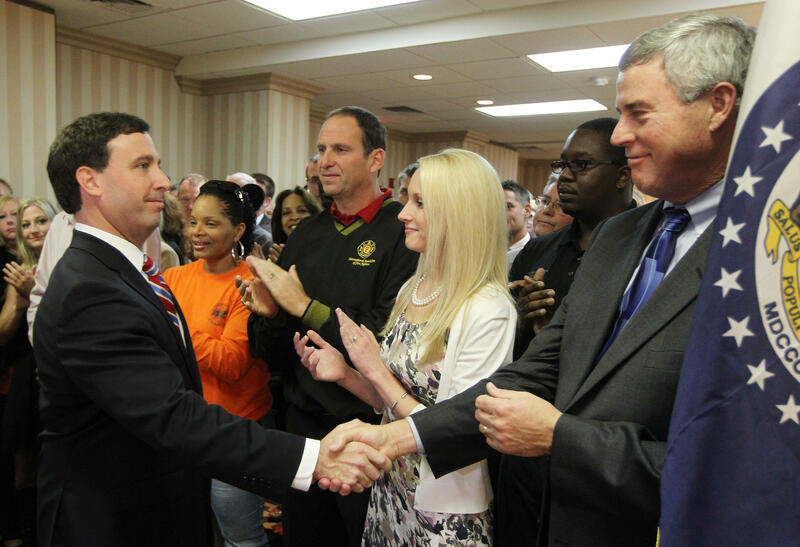 He's contributed close to $100,000 in in-kind contributions to Stenger's campaign. 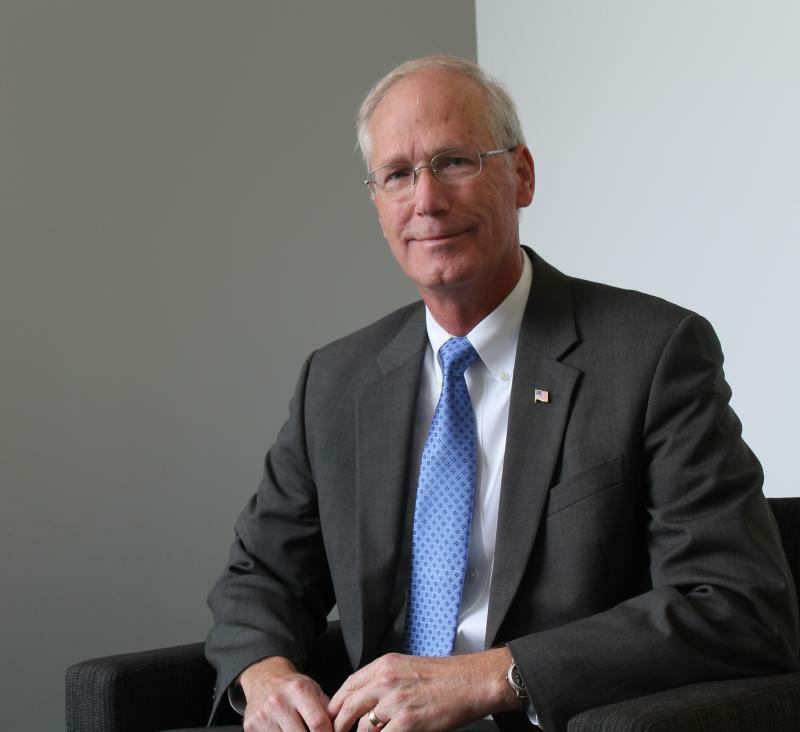 And he's appeared in ads attacking incumbent St. Louis County Executive Charlie Dooley and praising Stenger’s promise to “clean up” St. Louis County. McCulloch’s gravitas gave Stenger a significant leg up in winning August’s primary. But since Michael Brown’s shooting death, several political figures – including Dooley and state Sen. Maria Chappelle-Nadal, D-University City – are speculating that McCulloch may help Stenger again, this time in his race against Republican Rick Stream. Sen. Maria Chappelle-Nadal, D-University City, questioned whether McCulloch is holding back on announcing the indictment decision until after the November election. Neither Chappelle-Nadal nor Dooley are particularly close with McCulloch. And Chappelle-Nadal’s Tweet that the grand jury may be finished with deliberations was strenuously denied by McCulloch’s office. But McCulloch’s statements about when the grand jury may render its decision prompted speculation – especially the possibility that a decision not to indict Wilson may be delay until after the election to help Stenger. For his part McCulloch strenuously denied that he would delay the announcement of the grand jury's decision during an appearance Wednesday on St. Louis on the Air. McCulloch went on to say that "we’re presenting such voluminous amounts of evidence that it’s going to take some time. Mid-October was an aspirational date two months ago." "And now that we’re into it and we see how things are going and the amount of evidence and information, then it’s pretty clear now that it’s going to be closer to mid-November," McCulloch said. "Now it may be the first or second week — it may be a little before that. It may be a little after that. We’ll go with that as it occurs." Soon after McCulloch appeared on St. Louis on the Air, the St. Louis Post-Dispatch and the Washington Post reported that his office was looking into whether a member of the grand jury leaked information to somebody on Twitter. If that occurred, the articles state, then the entire process may have to begin anew. If McCulloch was trying to time the indictment announcement after the election — which, again, he's forcefully denied -- it may be more likely he'd do so by presenting lots and lots of evidence, not by concealing the grand jury's decision. But is that even possible? Two law professors — Saint Louis University’s Susan McGraugh and Washington University’s Peter Joy — both told St. Louis Public Radio that nothing in law stops McCulloch from delaying the public announcement of the indictment decision. McGraugh said Wilson's situation is different, which would make a delayed announcement unusual. But she added that the way this particularly grand jury is being conducted is decidedly unusual. For his part, Stenger said, “I have been in absolutely no communication with Bob McCulloch with regard to anything that’s going on in the grand jury.” But he also expressed strong doubts McCulloch is trying to use the grand jury’s timing to help his election. If Wilson is not indicted, some fear that it could spark widespread, even violent demonstrations in the St. Louis area — a possibility broached by both local and national news outlets. Last week, for instance, a reporter from KMOX last week asked Missouri Highway Patrol Capt. Ron Johnson whether the protesters were “emotionally prepared” to handle the possibility that Wilson wouldn’t get indicted. When McCulloch was asked a similar question during his appearance on St. Louis on the Air, he replied: "You’d have to have your head in the sand to think that regardless of what the end result is that there won’t be any demonstrations." "And again, I encourage demonstrations. But we encourage demonstrations that are done in a nonviolent manner," he said. "People want to express their opinion, they can express it. I’m very confident that whatever the end result of the grand jury, the grand jurors are pouring their hearts and souls into this and will make a decision and determination based on all the evidence." If the St. Louis County grand jury fails to indict Officer Darren Wilson, Prosecuting Attorney Bob McCulloch will immediately release full transcripts and audio recordings of the grand jury proceedings, his spokesman said Tuesday. State Rep. Rick Stream, the Republican nominee for St. Louis County executive, says that county Prosecutor Bob McCulloch should think seriously about whether he should remain in charge of an investigation into the Ferguson police shooting last month that set off weeks of unrest.